This post refers specifically to downpipes with a square cross section. It shows how to modify a rainwater downpipe spout (shoe) to stop a dripping noise when the drip starts within the outlet shoe. For drips that drop off the guttering outlet and fall all the way down to the bottom of a straight downpipe and hit the shoe you may get immediate relief from the noise by removing the shoe and letting the drip fall on the ground, roof or whatever is below the downpipe. In the long term this may cause excessive splashing under heavy rain which could cause damage to foundations or brickwork mortar, because the water is not directed away from the building. 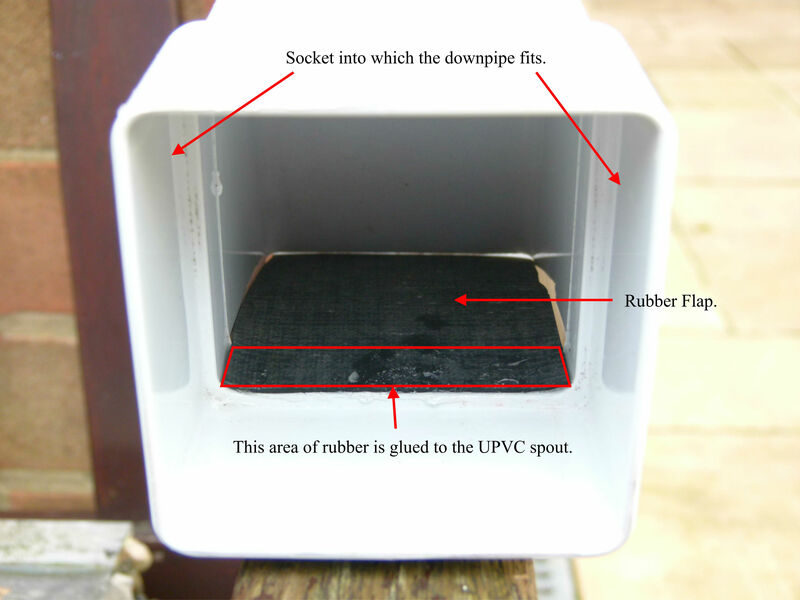 The drip needs to be guided to the side of the downpipe so it will run down the pipe and only tend to drip at the bottom where it can be dealt with by the method described here. Any method devised must not prevent leaves and dirt from being washed all the way down the pipe or a blockage will ensue. Drips falling from the guttering down to the shoe are loud due to the kinetic energy they gain by falling from a great height. So far the only method of stopping drips that fall from the guttering level all the way down to the shoe is to have an angled section as near to the guttering as possible. The principle is: The drip is caught after it has only fallen a few centimetres, so its kinetic energy is low, at the point where it lands in the pipe, so keeping the noise low. From then on it runs down the inside wall of the pipe until it gets to the shoe. This arrangement is mostly used when a roof overhangs the walls of a building and the downpipe has to be returned to the wall from a guttering some distance away. However this can be very difficult to achieve with square downpipe when the roof is not overhanging the walls sufficiently (the case in my situation) because the joints cannot be twisted to any angle. Exactly what is required can easily be achieved with round downpipe because it can be rotated at the joint to any angle when it is returned to the wall. The guttering is extended beyond the end of the roof to allow this fall back to the side wall. This is exactly the method which will catch the drips after falling a short distance. However with square downpipe the bends can only be inline with the guttering or set at right angles. This too will catch the drips. Round downpipe can be twisted to any angle. It can be fixed close to the wall and deal with small guttering projections. In 2012 I had new PVC guttering and square downpipes. From one downpipe in particular I could hear a regular dripping noise when it was raining. While I was in bed I found the dripping noise very annoying. During the day I climbed onto a ground floor roof in the rain to examine how the dripping noise was produced. I found water was running down the inside wall of the downpipe, on the side with the spout opening, until it arrived at the spout. The water then dripped from the top of the spout opening and landed on the bottom of the spout which worked like a sounding board. This resonated up the hollow pipe making the dripping noise too loud. Fortunately water dripping the short distance from the spout to the roof below didn’t make a loud dripping noise. So I didn’t have to concern myself with that aspect of dripping water. I realised that the way to stop the dripping was to ensure the water continued its downward journey to the bottom of the spout along a surface so it would not stop to drip. In my particular case I glued a piece of rubber sheet (left over from the repair to my flat roof) to the inside of the top of the spout, using Clear Adhesive 1985 for PVC made by STELMAX Specialist Adhesives. This adhesive can also be obtained from other stockists, e.g. AB Building Products. The width of the rubber sheet was similar to the spout width such that it was free to flap around when pushed by water descending the downpipe. This rubber sheet was long enough to pass all the way to the bottom of the spout. Now the water has four sides to run down to get from the top of the downpipe all the way to the bottom of the spout. The rubber isn’t sealed at the bottom so small quantities just leak away. Heavy rain and debris from the roof can easily push the rubber sheet out of the way to exit the downpipe. I used rubber sheet left over from my hall’s new Firestone EPDM rubber roof to make the flap. The rubber flap was stuck onto the shoe after cleaning both with water and washing-up liquid. I am a little concerned about what will happen to water coming down the downpipe in freezing weather. Water around the edge of the rubber flap may freeze it to the spout in a closed position. Maybe there will never be any water passing down the pipe under freezing conditions. If there is it may melt any ice on the flap anyway. 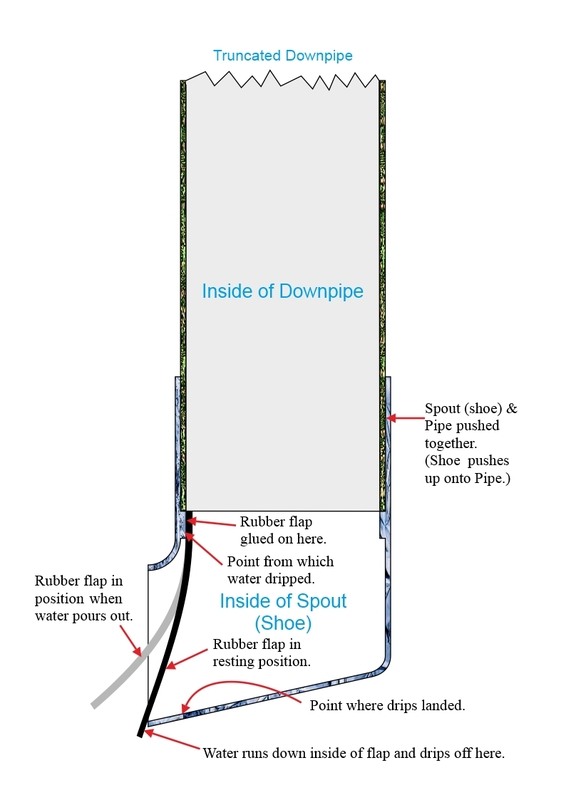 Rainwater Downpipe Shoe with rubber flap attached as seen from the socket end before connecting to the downpipe. NOTE: If the shoe has been glued onto the downpipe you may have to either remove the whole downpipe to work on it or glue the rubber flap on working blind. Either way remember to clean the area that the rubber flap will be stuck onto with water and washing-up liquid because it might have got dirty with all the dirt that washes off a roof. Sometimes the shoe is so near the ground or roof below that it can’t be removed without some or all of the downpipe fixings to the wall being removed so that the downpipe can be either moved or totally removed. Good luck with your mod Mr rawsonrhys. When I had my new guttering it was before I realised there could be serious dripping problems and I talked the man out of any bend because it looks so much better straight. The best scenario is when the roof overhangs the walls so that the downpipe needs bending to bring it close to the wall for fixing to it. Then the bend looks like it should be there. My roof doesn’t overhang enough so I would be stuck with a sideways bend. Consequently I have to shut the window if it rains and I want a quiet night. I’ve thought of doing all sorts inside the pipe but I’m sure anything I build into it will cause a blockage when moss and leaves get washed down it. Have you ever heard of noise from the water running in the gutter due to the amount of water coming off the roof, as opposed to the noise made by water running down the downspout? No. You’re the first person to mention it. I’m sure that with a transom open just under a gutter its possible to hear water dripping off the tiles into the gutter. especially if the gutter doesn’t drain well and has a puddle in it. If there’s a heavy rain storm I’m sure there would be that much noise from the rain in general that the noises in the gutter would not in themselves be a problem because they’d be drowned out. Thanks for the info. I have this problem and it is really annoying. I have ordered a set of tennis balls and am going to shove one up each of the offending outlets at ground level. My theory is the noise will be much reduced due the drips hitting a round soft surface rather than a hard flat plastic surface. My square pipes are 2.5 inches across and a standard ball is 2.7 inches, so it should wedge in there tightly. I’m also going to spray the balls with water-proofer so the balls don’t get water-logged and heavy. I’m sure you will want to extract them, by some means, so you can remove any debris that builds up behind them. Maybe you should attach something to them. A cord perhaps through holes in the balls. I have to say, after the passage of time, putting a double bend in the downpipe up near the guttering is my favourite.